Trip Logistics: Getting to the Beginning! 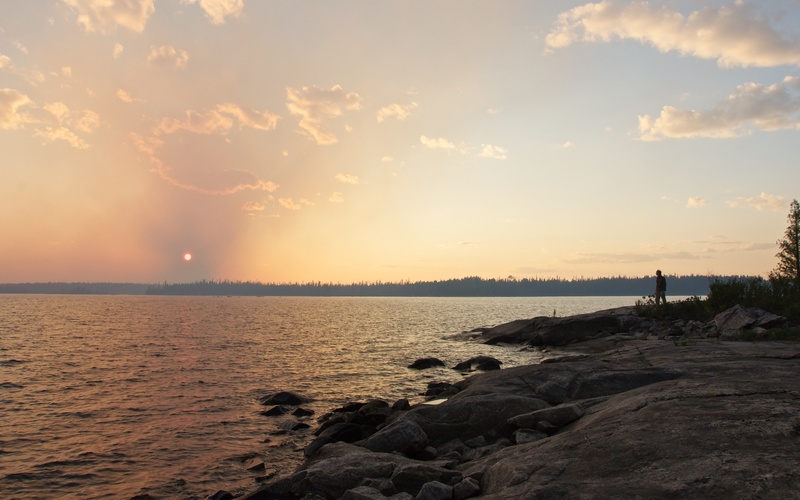 If you really want to get away from the crowds, then Wabakimi Provincial Park in NW Ontario is an obvious choice. 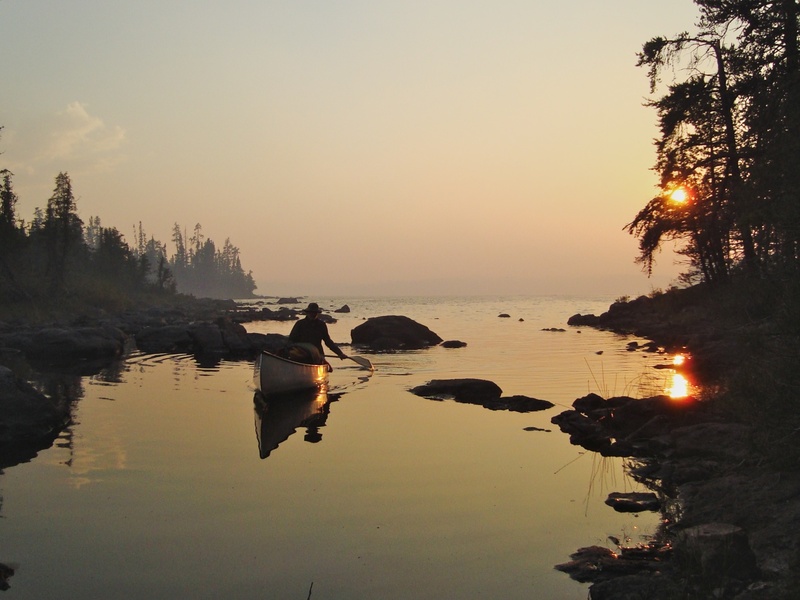 For every hundred paddlers churning up the waters of Algonquin or Killarney or Quetico, there are maybe one or two in Wabakimi. But for us, there is a price to pay- and that is the time needed to get there. I should add that we live in southern Ontario (London and Toronto) so Armstrong Station is a long way; if you live in Wisconsin or Minnesota or Thunder Bay the park is almost on your doorstep! 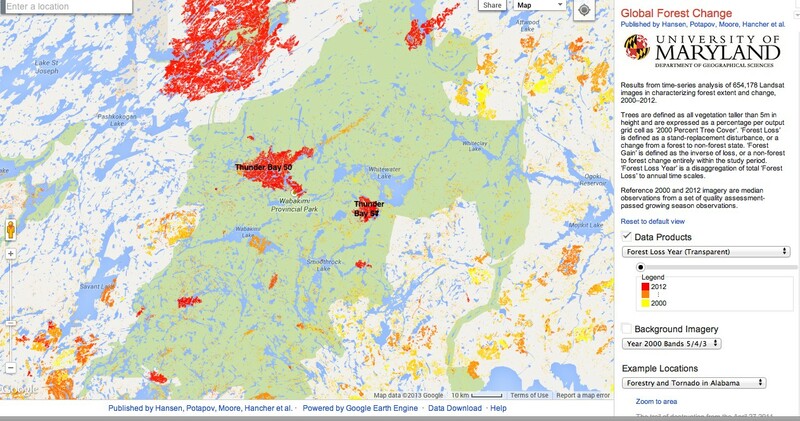 Take a look at the Google map below to see where Wabakimi Provincial Park is in the bigger picture. 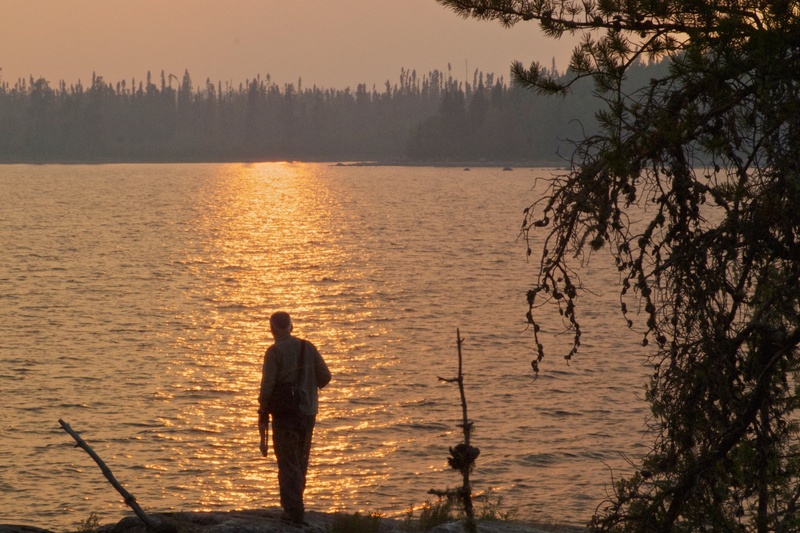 Our 2010 visit to Wabakimi Provincial Park very definitely gave us every reason to go back for more and that is what we did the next year. 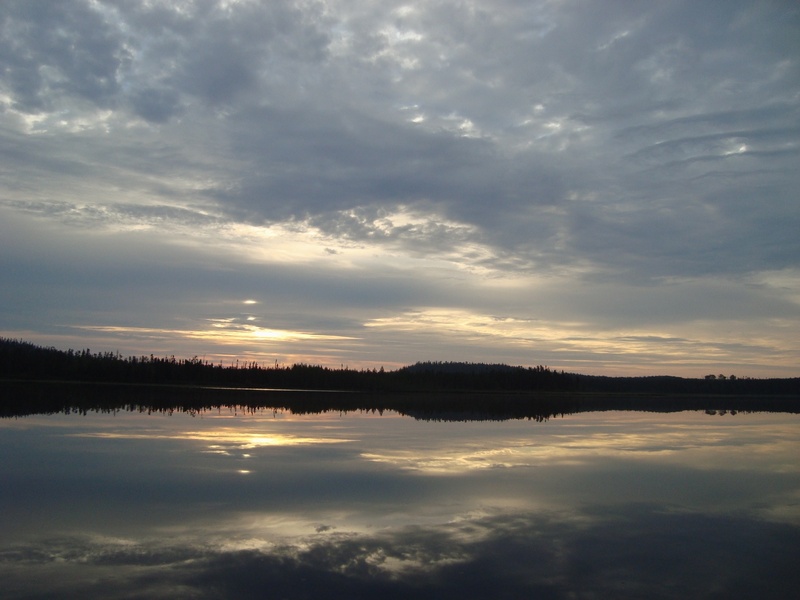 (Check out our trip report “Discovering Wabakimi: Paddling to the Center of the Universe” for more info.) 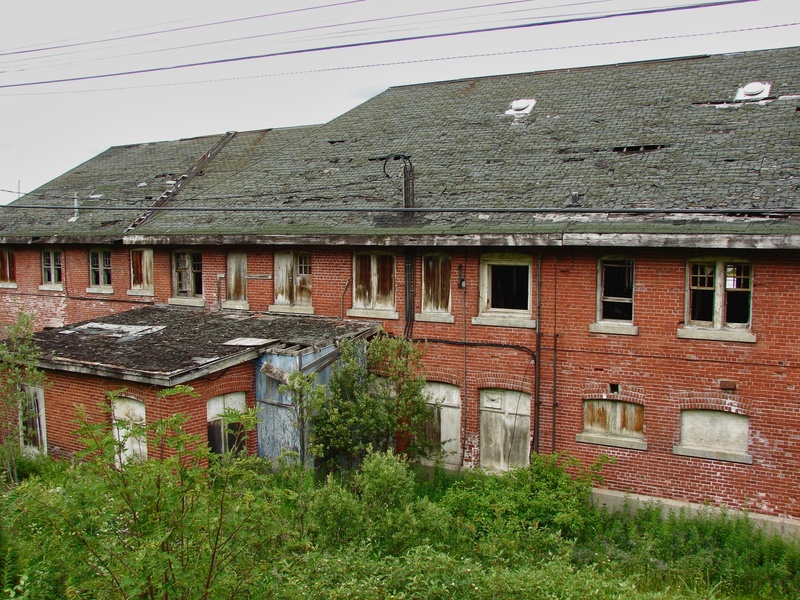 This time the plan was a bit different; instead of doing the 1600-kilometer trip by car, for example, we would be taking the VIA train (known as The Canadian because it ends the journey that it starts in Toronto four days later in Vancouver). 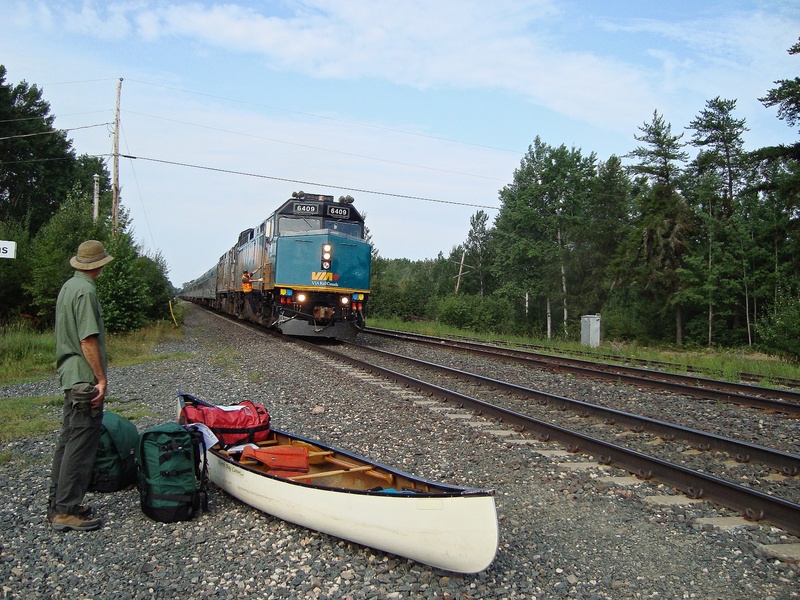 My brother and the canoe would start at the train station in London and I’d meet him at Union Station in Toronto. The cost of a return ticket in 2011 was about $500. (It is in the $350. range if you are over 60.) The canoe would cost an extra $50 each way. 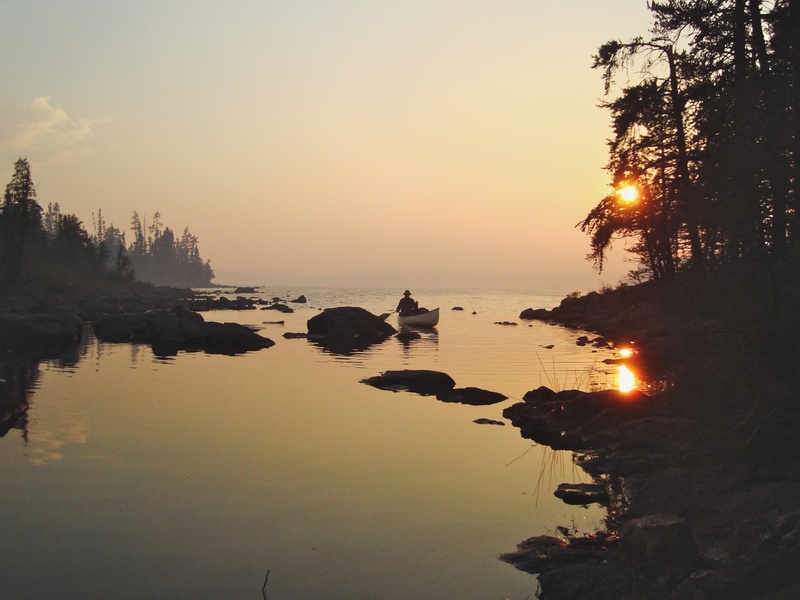 (Update: in mid-2013 VIA doubled the baggage charge for canoes. It is now $100. per train used. Click here and go to “oversized sports equipment” for the info. ) 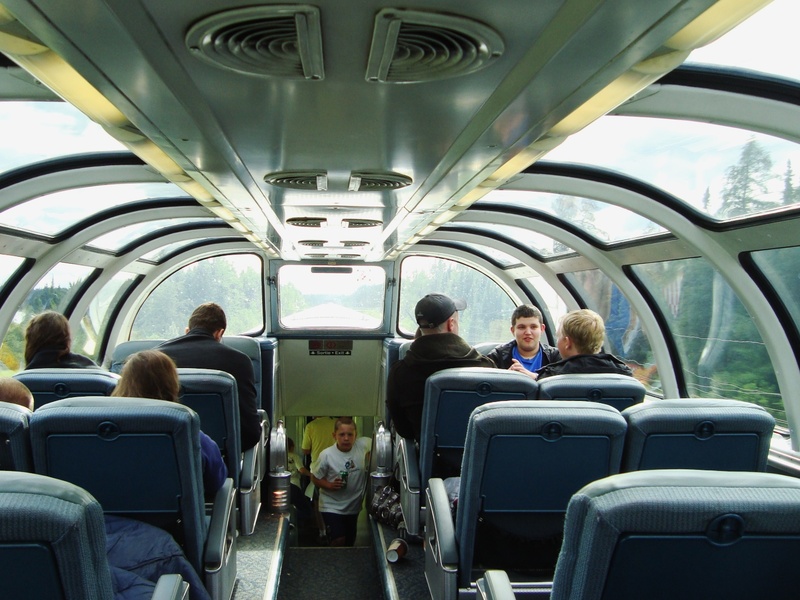 If like us, you are coming from southern Ontario or from Manitoba on one train, I think it is still a fair price. 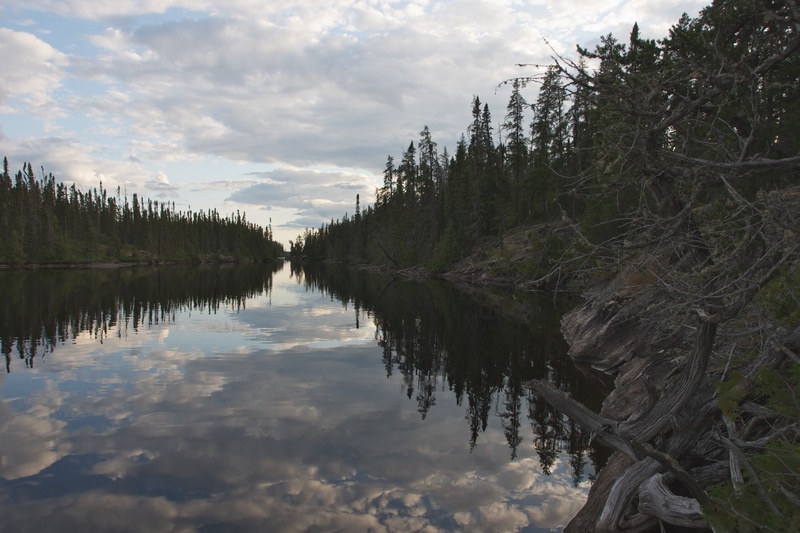 If you drive up to Armstrong Station and then use the train to get to Allan Water Bridge or Flindt River Landing or wherever to start your Wabakimi canoe trip, the canoe fee is reduced. 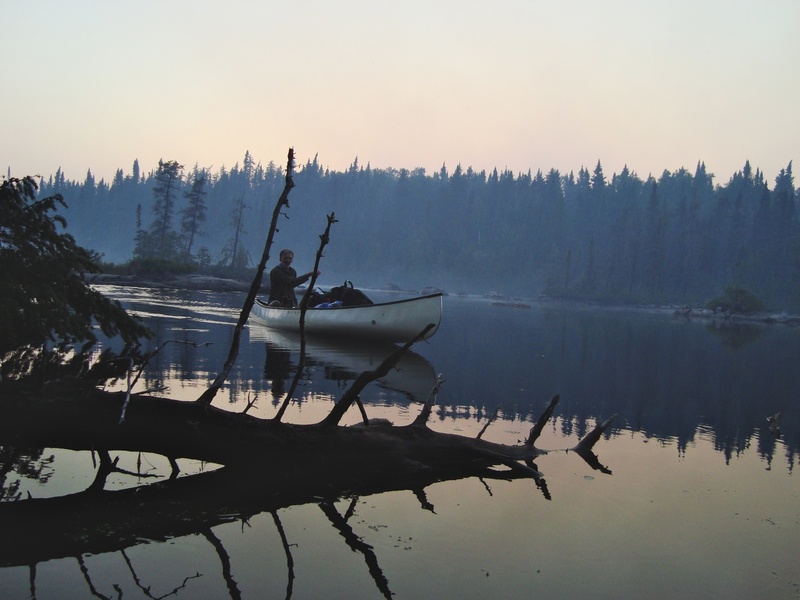 The one time we put our canoe on at Armstrong Station for the ride to Allan Water, the VIA attendants only checked our passenger fares. They made no mention of the canoe charge at all – and that was when it was still $50.per canoe. I think the policy – official or not – is that the canoe fee will not be more than the price of the ticket from Armstrong Station to wherever. So if you have to pay anything for your short ride it will definitely be much less than $100.! We left Toronto on a Saturday night at 10:30 (just an hour late) and got to our destination at 11:30 the next night. Click here to see a copy of the timetable. The Canadian leaves Union Station every Tuesday, Thursday, and Saturday. We left on a Saturday, July 23. We had made a reservation with the folks at the Flindt Landing Camp for one of their cabins for the night of our arrival. One could in theory (or to save some scarce dollars) look around for a camping spot in the vicinity upon debarking the train after a 25-hour ride- but I must admit it was nice not to worry about finding a tent spot at 11:00 p.m. Okay, so it cost $80. (or was it $100.- I honestly can’t remember!) and we used the cabin for about ten hours- which on a per diem basis puts it right up there with the Royal York Hotel in downtown Toronto- but it would be our last bit of luxury for a while. At the other end of the trip, the logistics were also a bit different. 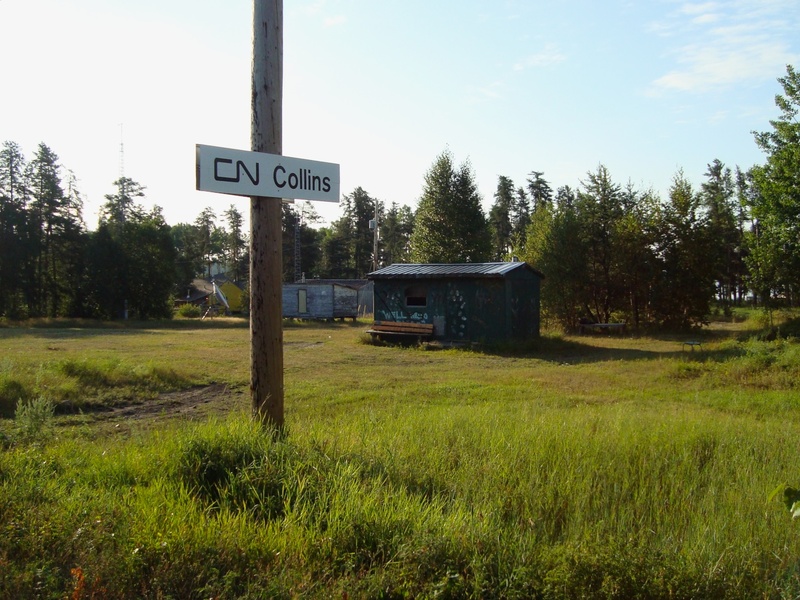 Instead of ending the trip at Little Caribou Road about 6 km from Armstrong, we paddled to Collins at the north end of Collins Lake on the last morning and were at the railway tracks which pass through the non-reserve status Ojibwa settlement of perhaps 200 people by 8:30 a.m. waiting for the train’s 9:30 arrival. the eastbound VIA- just a little bit late! We had arranged for the eastbound VIA train to pick us up on a Monday (August 8). 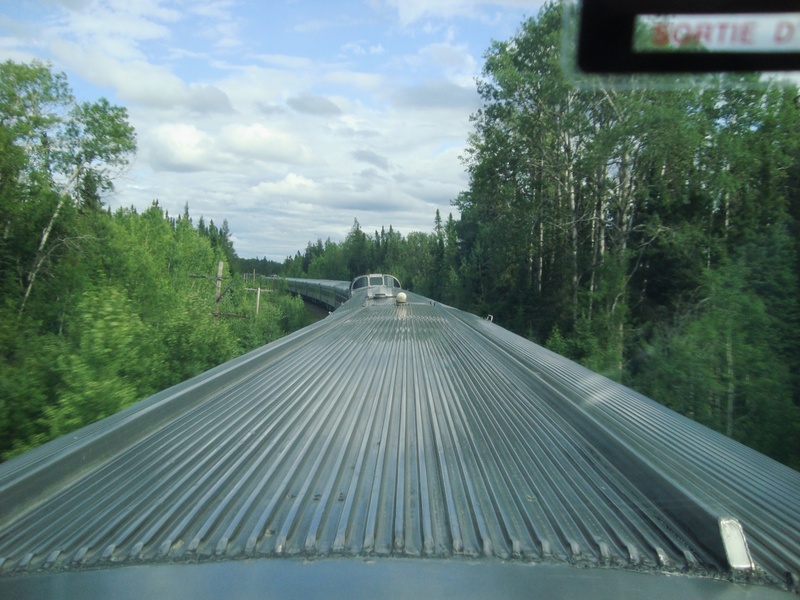 (There are three eastbound trains passing through the Wabakimi area each week- Monday, Wednesday, and Friday.) Everything worked out just the way it was supposed to! Within thirty minutes of boarding, we were in the dining car having a breakfast other than oatmeal for the first time in over two weeks. We were on our way home- and a day later we would be! Unlike the previous year, we did not get tent-bound because of wind or rain. All in all, the weather gods were very kind to us. In fact, on more than one occasion we hoped for a massive rainfall to drench Wabakimi but good! And why? 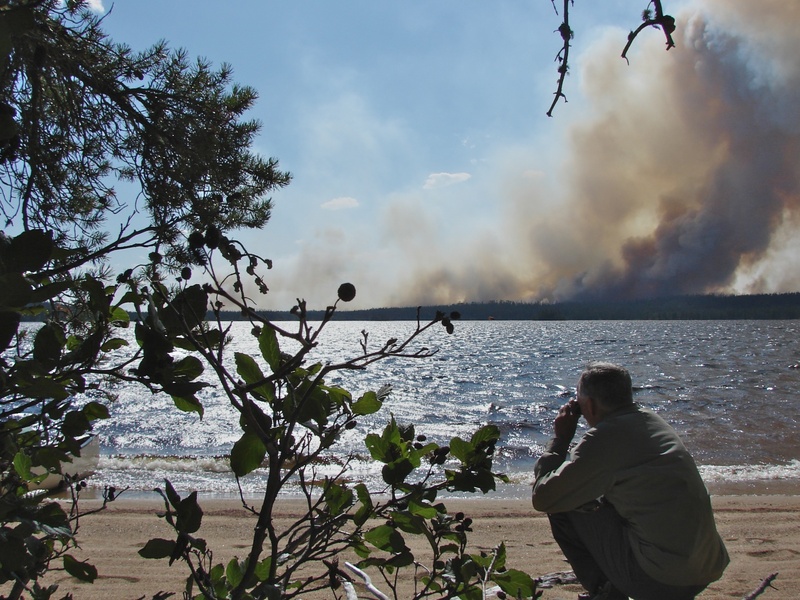 Perhaps you will recall that the summer of 2011 in Ontario was the summer of bushfires- at least in the region that we were headed to. 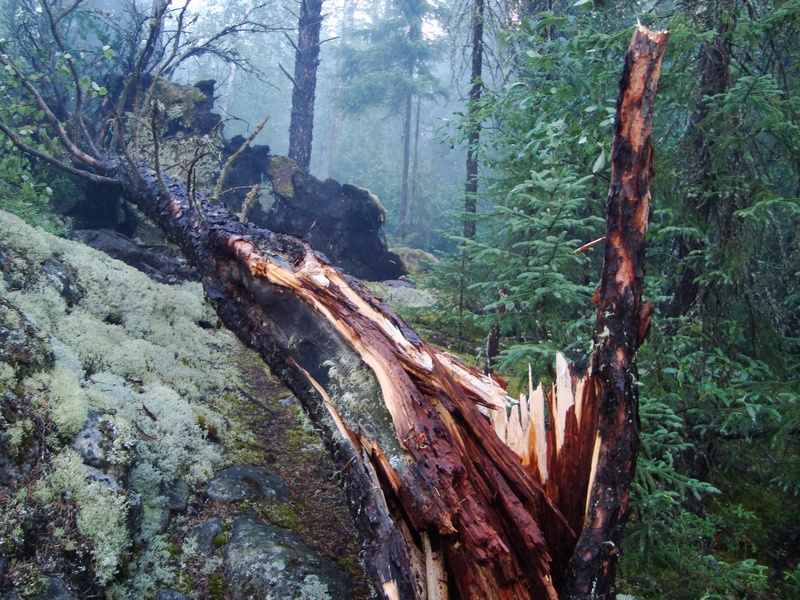 The Red Lake area to the NW of Wabakimi Park seemed especially hard-hit. Somehow the park itself was exempt from the fires that were springing up – well, at least until a few days before we left. 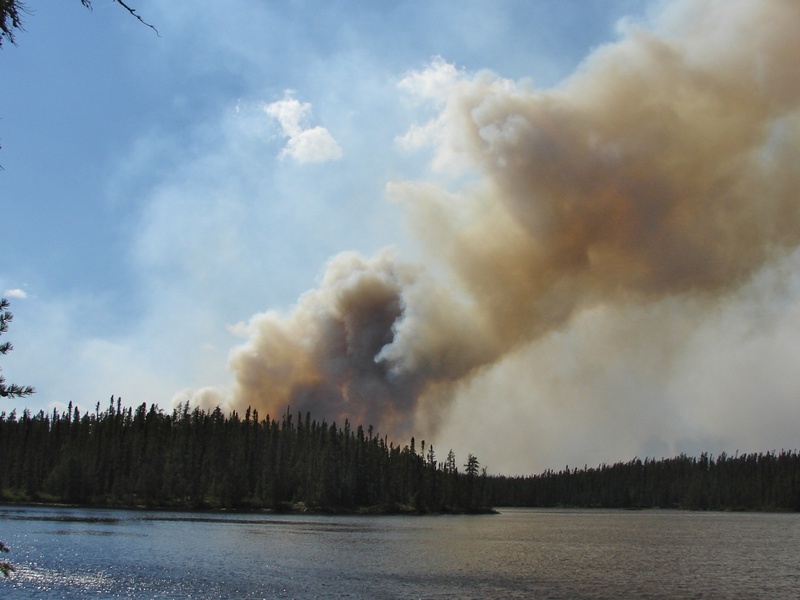 That is when we noticed a new fire right near Burntrock Lake, ironically the halfway point of our original route. 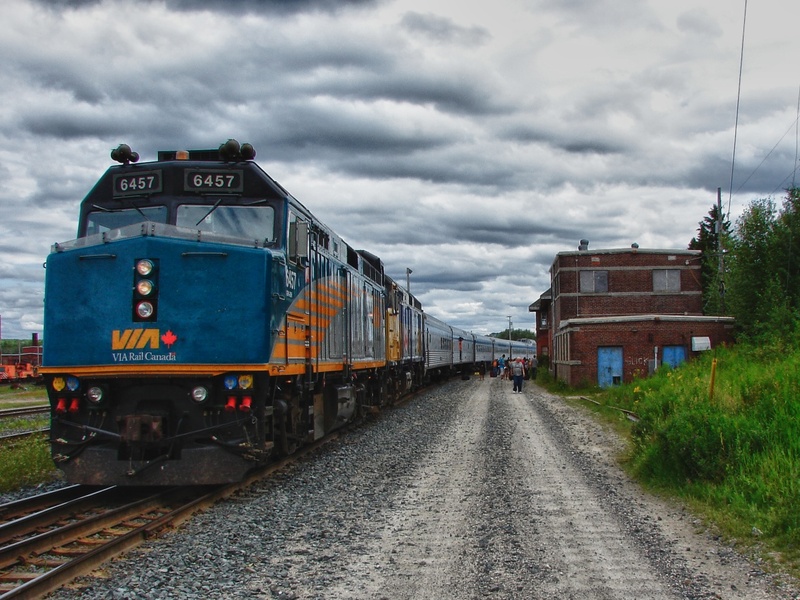 It even had a name – Thunder Bay 50. (We had planned to paddle up the Palisade River to Burntrock Lake, take a look at the lake, and then paddle back down the Palisade to Whitewater Lake via the Grayson River and Arril Lake.) What to do? Wabakimi – yes or no? 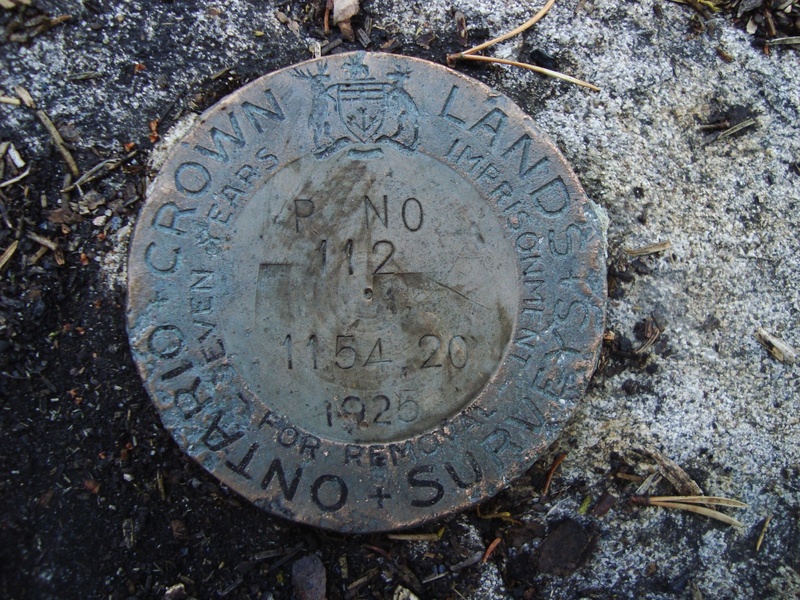 Phone calls to the park warden John Thomson and to Ministry of Natural Resources officials up in Thunder Bay convinced us that our trip was still a go and that we weren’t mad for persisting in the face of a danger that everyone but us could see clearly. However, the park warden wishing us a great trip was not carrying a lot of weight with our significant others. Promises of extreme caution on our part and the addition of a Spot Connect so that our progress and whereabouts could be monitored were what we left as we headed to the train station with our gear. Ideally, we should have added a satellite phone but it was not possible to come up with one in the 24 hours we had. We did promise to stop at the various lodges and camps along the way on the assumption that the folks there would have sat phones and the latest info about the fire situation. 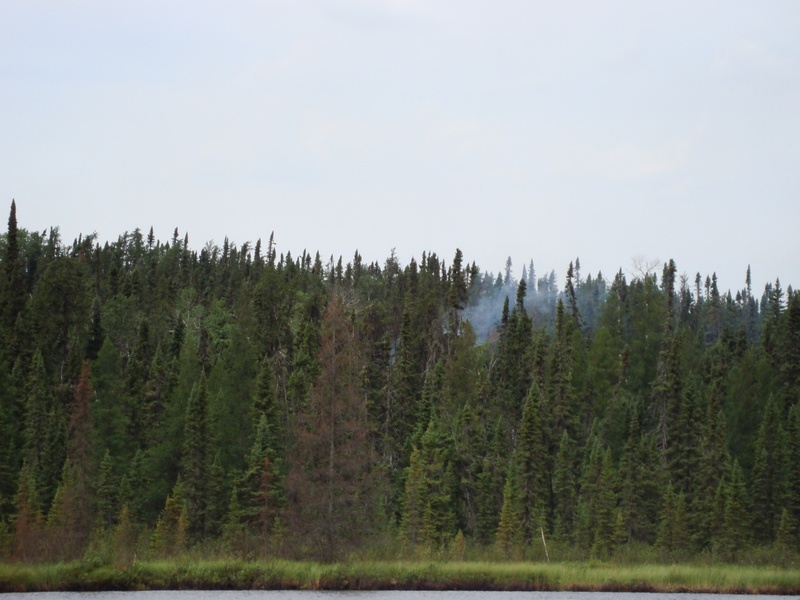 For the first three days – the time it took us to get from Flindt Landing to Lake Wabakimi – we did not see or smell any evidence of the fires that the media down south made it sound as if they were gobbling up square miles of bush each hour. 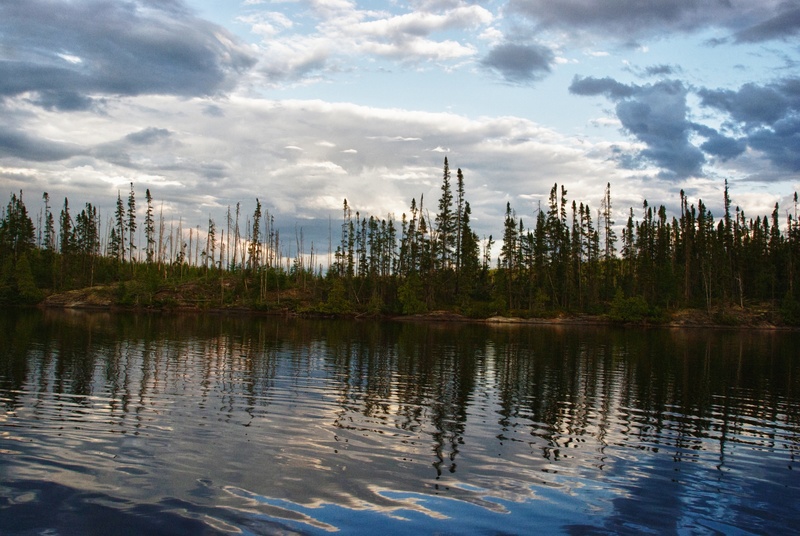 Our luck would change as we paddled across Kenoji Lake and started up the Palisade River. Just as we entered River Bay from Wabakimi Lake we met an MNR (Ministry of Natural Resources) ranger whose float plane we approached while he was checking the fishing licences of some other boaters. He suggested that the Ogoki River into Whitewater might be the best option for us. When we got to Kenoki Lake, we decided to check out the Palisade River entrance. As we went up we paddled past a campsite that a couple of canoe trippers from Toronto were just leaving. They had just come back down the Palisade the night before due to the fire (its name was Thunder Bay 50!). It was obviously alive and burning and getting bigger. We decided to paddle up the river to see the dramatic rock face along a stretch of the Palisade which some had compared to a canyon; we’d also paddle to the point on the Palisade where the turn-off to Slim Lake was and see what was going on. 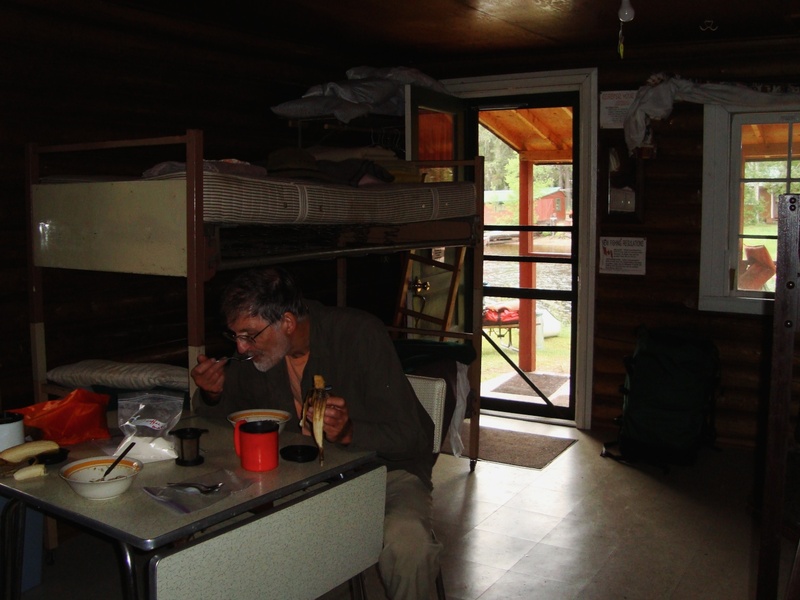 We camped that night at the campsite just vacated by the two paddlers from Toronto we had spoken to earlier. We were definitely in the presence of a bit of history! 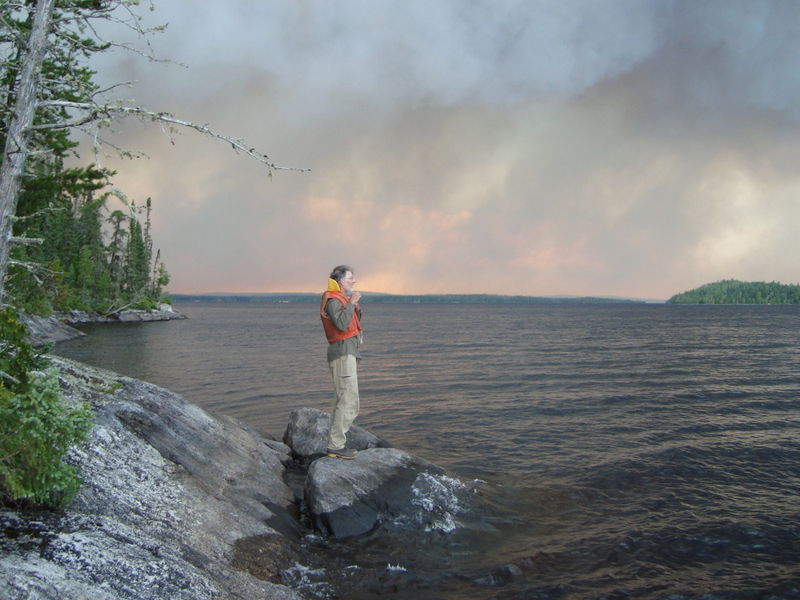 But it was the smoke from Thunder Bay 50 that was most obvious. 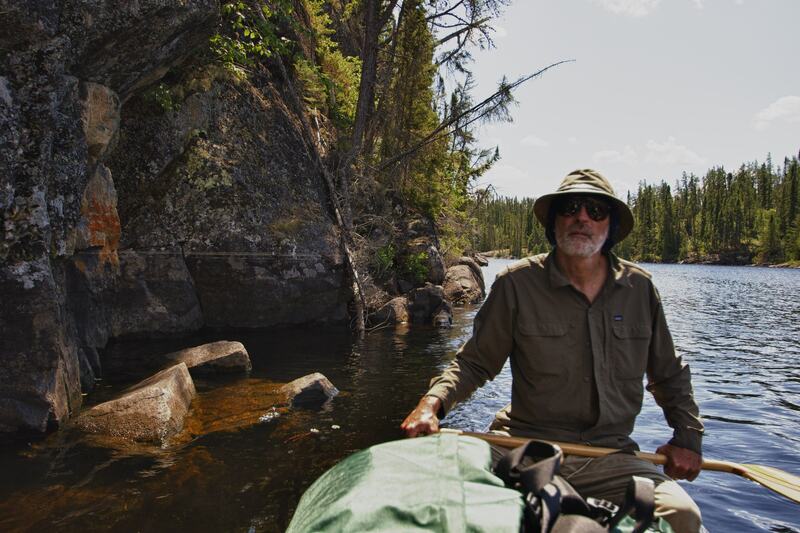 2. we could paddle back up the Palisade River, turn east on to Slim Lake, and find a campsite on Arril Lake after paddling the first bit of the Grayson River. Given that the smoke had died down the previous evening, we decided to go with option #2. 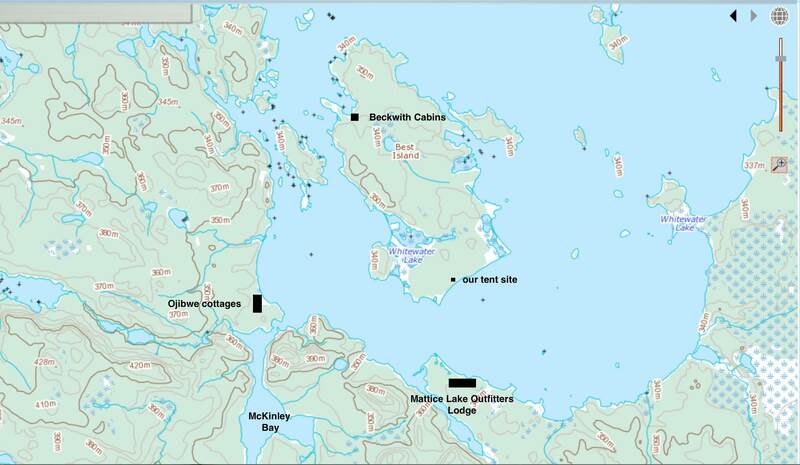 The fact that we had already paddled the route from option #1 the previous summer undoubtedly factored in. We got up at 6:00 to a golden sky with the intent of putting some distance between us and Fire Thunder Bay 50 before mid-morning. By 3:00 we’d be at Arril Lake and all would be good. 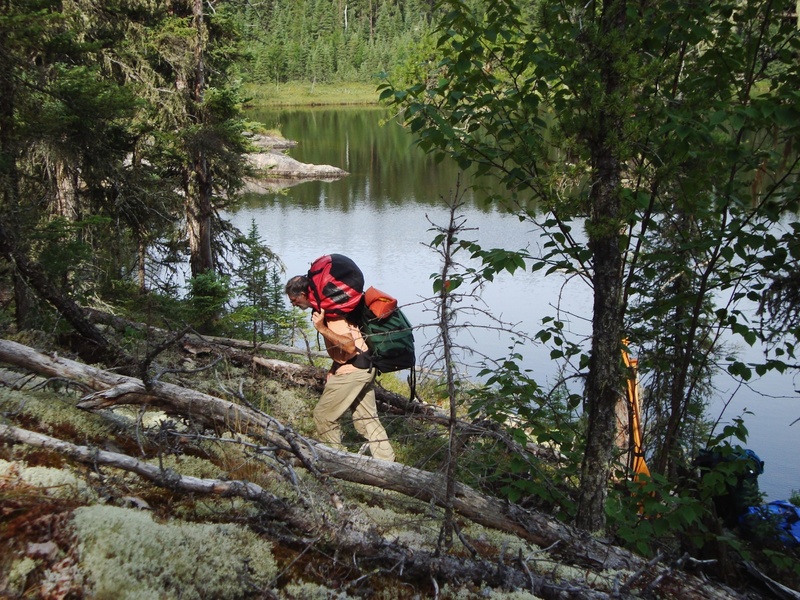 Paddling through Slim Lake and doing a couple of portages, we were soon in Scrag Lake. 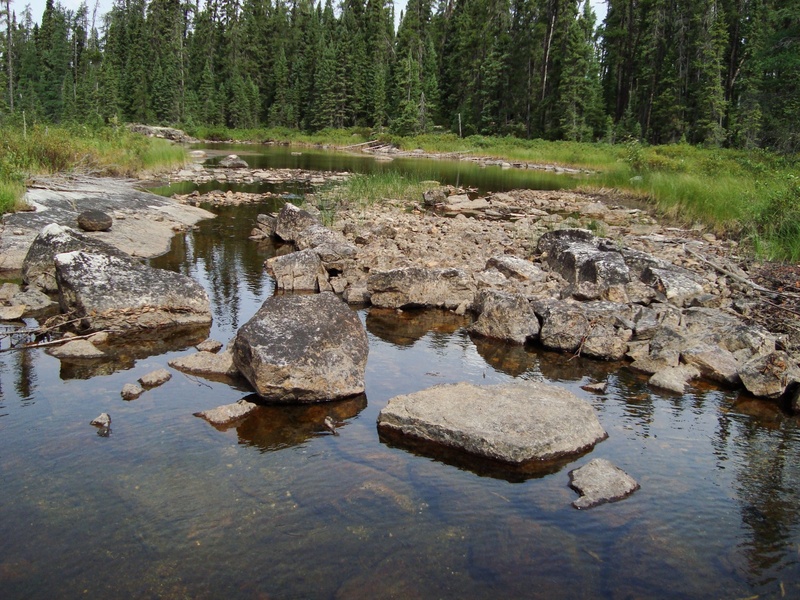 And then came the Grayson River – given the lack of water it would prove to be a bit of work. the Grayson River(bed)…all it needed was more water! And then we spotted our first smouldering fire – a small one just off on the west side of the river. the fire from our now-abandoned campsite! the scene at the NE end of Arril Lake at 4:00 p.m.
After maybe forty-five minutes of sitting on the beach and taking in the incredible scene, we left Arril Lake and headed towards the much bigger Grayson Lake. The winds were still quite strong and were whipping up the fire but it was great to put some distance from it. An hour and a half later and we were entering the main channel of Lake Grayson. Now all we had to do was paddle down the southern channel and we’d feel a lot better. Two things happened in the next 45 minutes: first, there was one hell of a downpour that went on for at least 35 minutes. 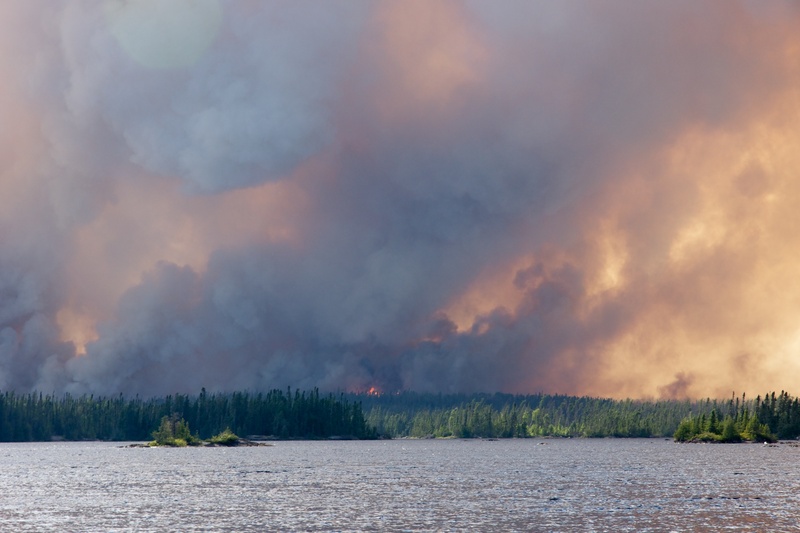 It was such a relief to see that water come down – that it was cooling off the boreal forest that was being eaten up by Thunder Bay 50. 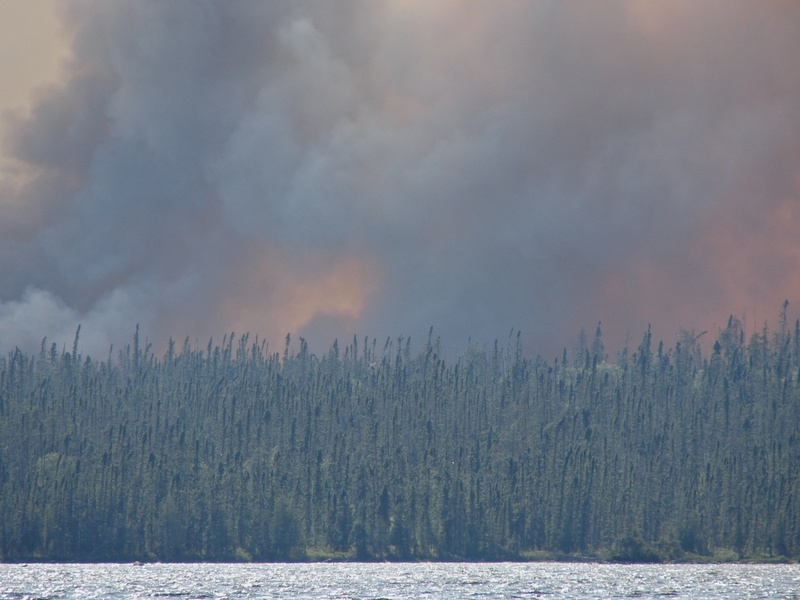 Second, our chat with the Parks Canada official flying with the helicopter crew taking care of the lodge also filled us in on what the parks people thought about the fire. Naive that we were, it was a bit of a shock to hear that they were just going to let the fire burn itself out, that this corner of the park actually needed a good fire to get rid of all the deadwood that had been accumulating for years. And here we had been, looking into the sky for the water bombers to fly by and put an end to the fires! We gave the Parks Canada guy our personal info and were reassured to hear that we were headed in the right (i.e. south) direction. 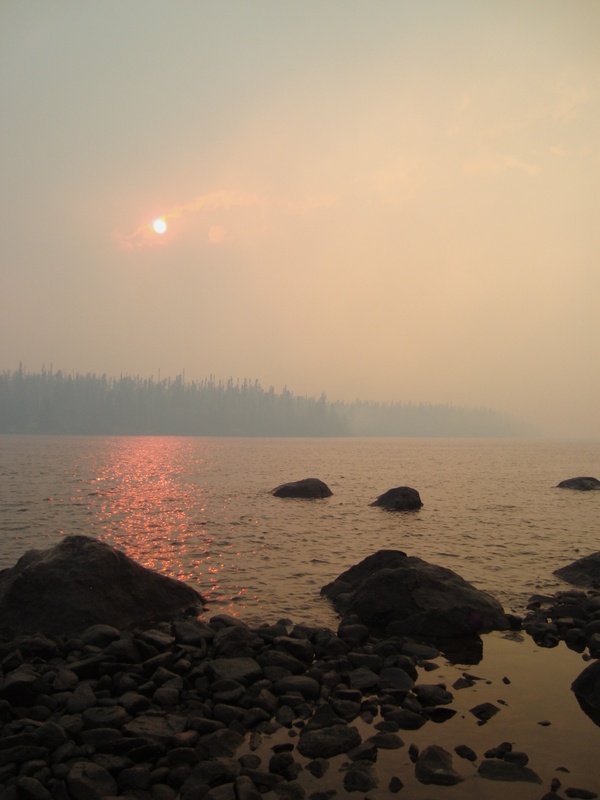 The sky was now filled with the smoke of the doused fires. Lake Grayson after the 30-minute downpour put a damper on the fire! It was like a fog had settled down on the area but it did make for some dramatic photos. It felt like we were in a scene from the Lord of the Rings movies – there was something eerie about being there. It was also getting late and we had been on the move for almost fourteen hours. 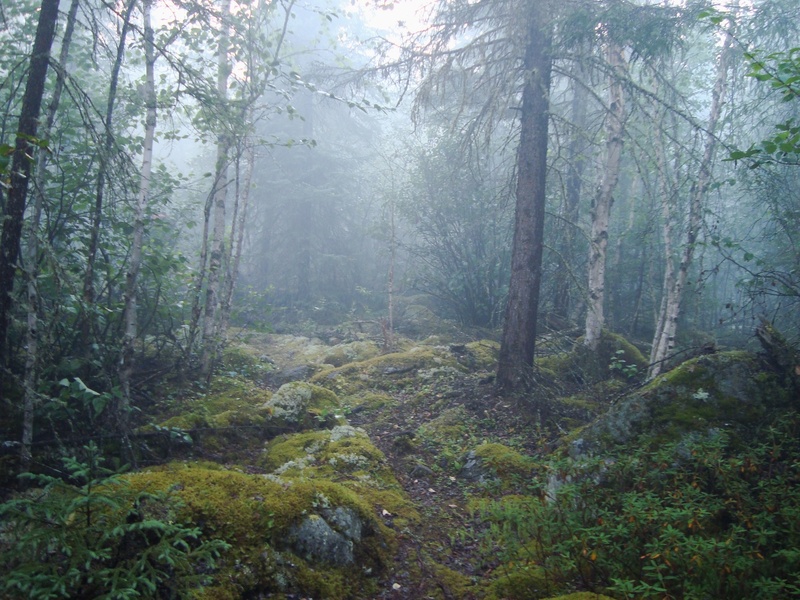 One more impossible-to-find portage trail and we headed for the tent site indicated on the Wabakimi Project map. We were so beat that we didn’t even bother with supper that night. Max paddling into a bay where I think there is a portage trail- I may have been wrong! We bushwhacked. The next morning we got up later than usual and had a leisurely breakfast while all of our wet gear was spread out in the sun. We were feeling better now that we had turned the corner on Thunder Bay 50 and were heading into territory we had paddled the year before. 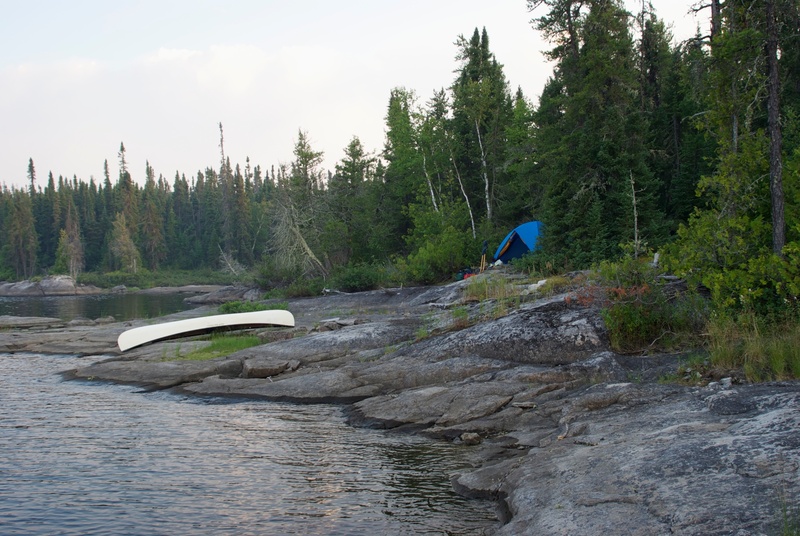 The goal for the day was a modest one – we planned to tent on one of the small islands just to the west of Porter Island as you leave the Grayson River and enter Whitewater Lake. 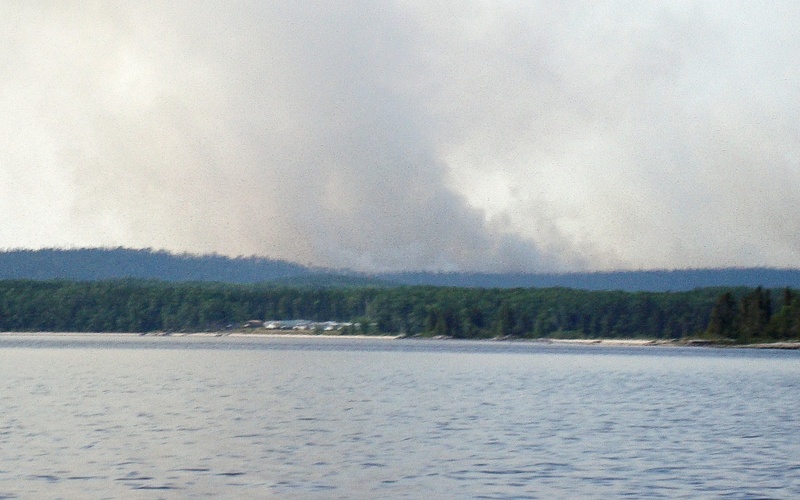 A look back north confirmed that the fire was still smouldering but we were heading in the right direction. We found a nice tucked-away-from-the-wind campsite on the east side of a small island. The sunset that evening was impacted by the ash particles in the air. 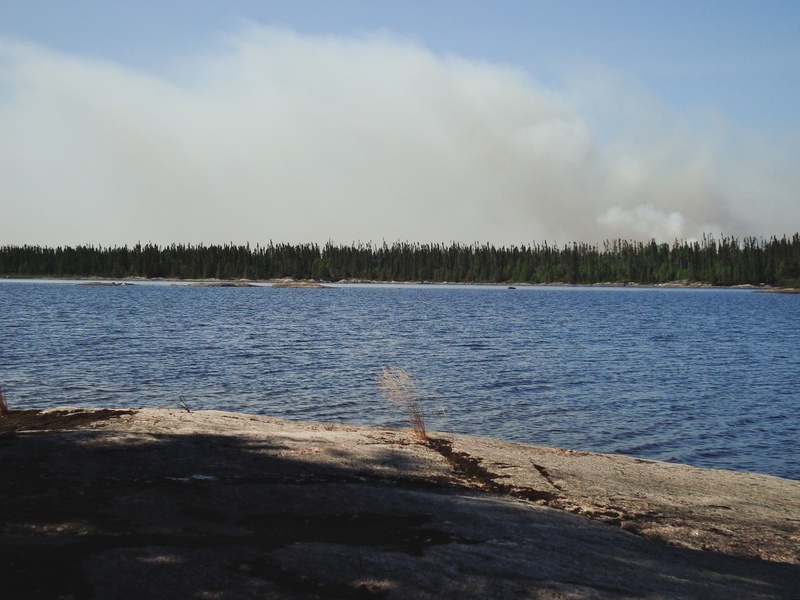 The air was thick with smoke and ash from the fire was falling onto our tent. 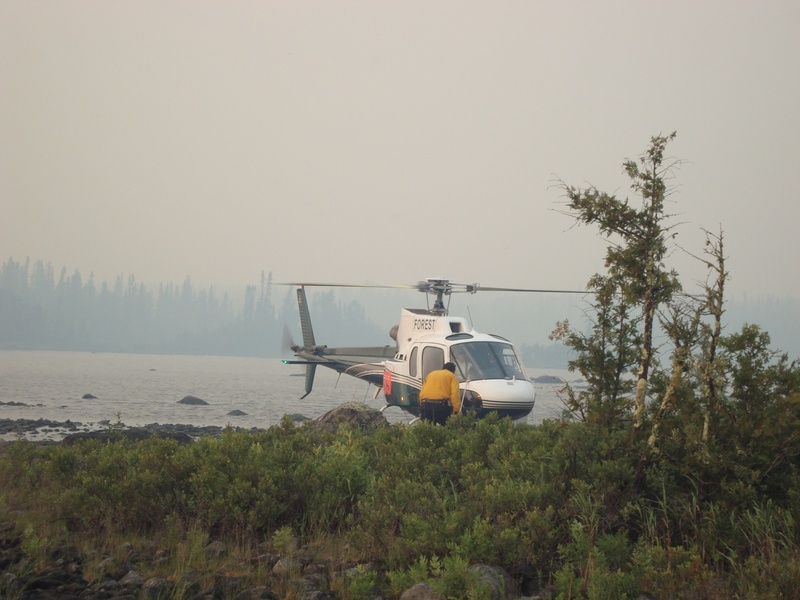 Seeing a helicopter land at the outfitters’ lodge across the water, we went over and chatted with the crew foreman about the situation. They were there to set up the hoses to create a water sprinkler perimeter and get the water pump motors running. He said we should have no problem paddling south into Lonebreast Bay the next morning. We got up at 5:00 the next morning and were into McKinley Bay by 6 a.m., intent on paddling away from the new fire and into Lonebreast Bay to the south by 11:00. 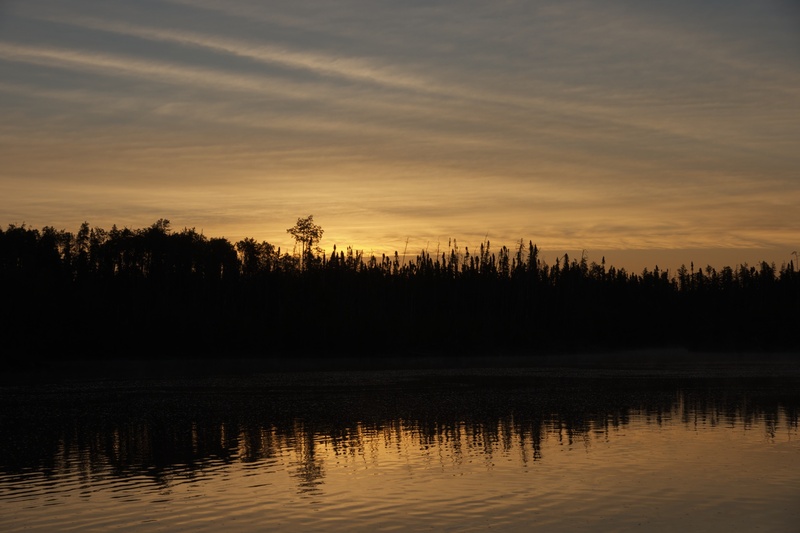 We had a later-than-usual breakfast on a flat rock in the middle of one of the lakes leading to Lonebreast Bay from Whitewater Lake; then it was time for a portage. Just as we got to the end it started to rain – not the torrential downpour we had seen on Grayson Lake but still a nice rainfall which was sure to cool down the bush around us. 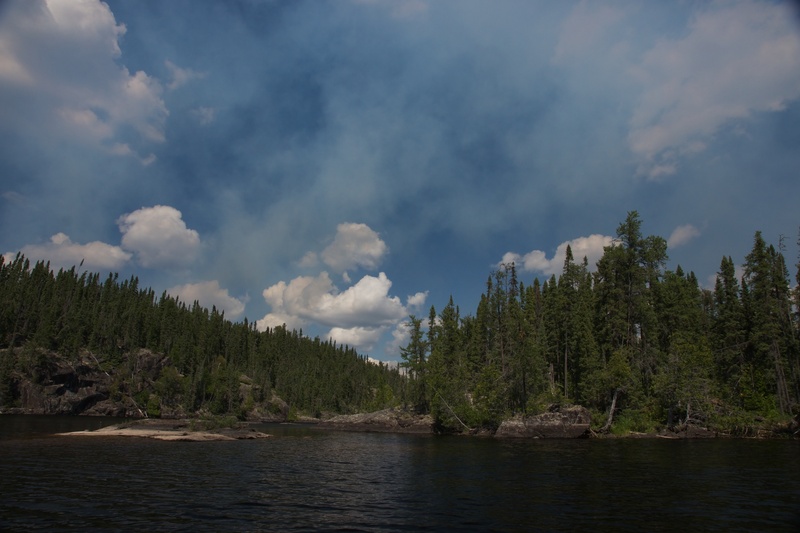 The rest of our trip – the next six days – would be free of the kind of drama that we had paddled into when we went up the Palisade River towards Burntrock Lake. While there were times when we could smell smoke in the air, we never did see what we had seen during the four day stretch from the Palisade to Whitewater. 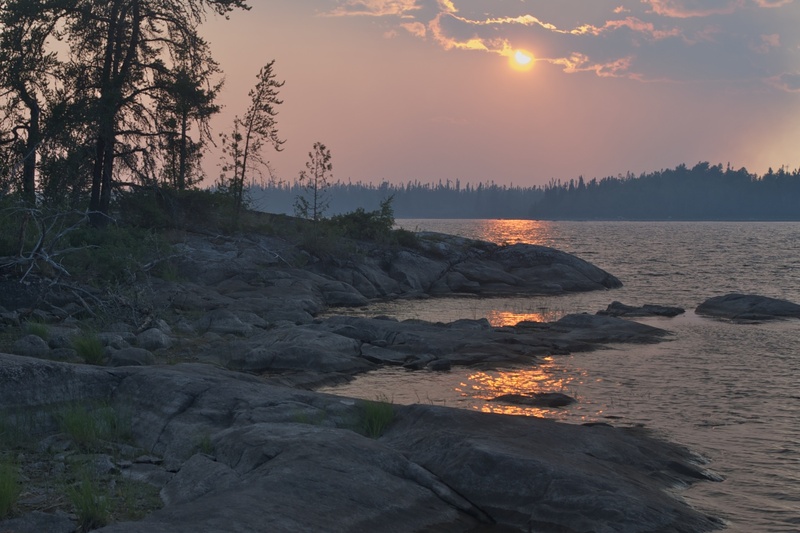 If you want a day-by-day account of the trip, complete with detailed maps and more pix, take a peek at 2011 Wabakimi Itinerary and Pictures. Among other things, you’ll find out what we ended up doing with the 15+ liters of blueberries that we picked on the last two days! 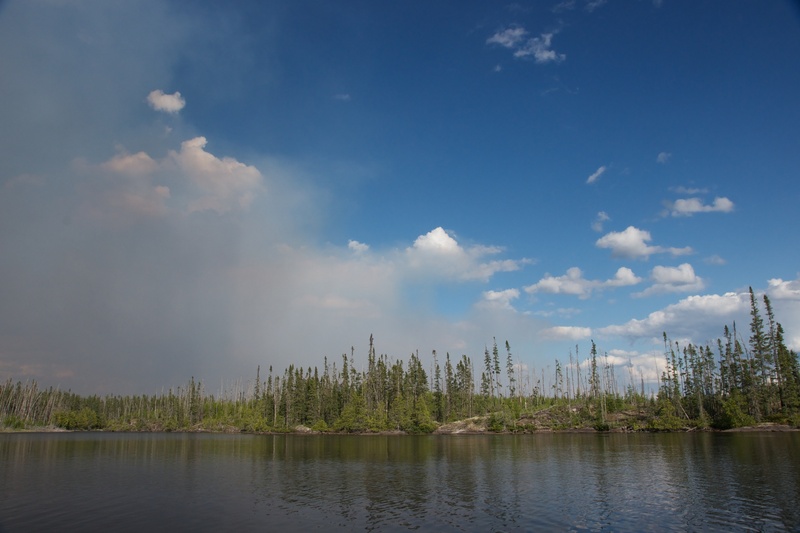 To put some historical perspective on the Ontario forest fire situation of 2011, check out these stats. The 2011 fire season really stands out! 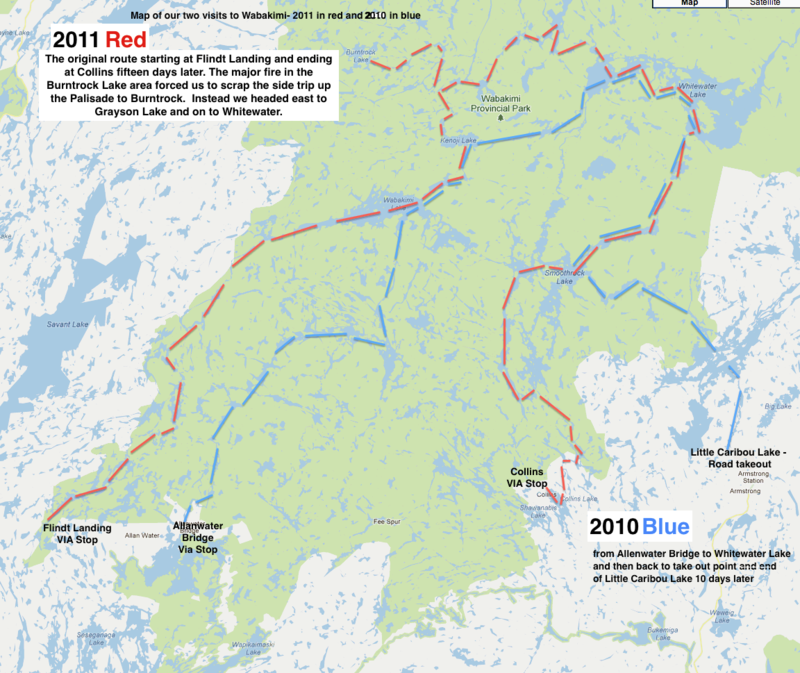 The map below very graphically illustrates the areas affected by fire over the past decade or so – with the red areas being the most recent (i.e. 2011 or 2012). 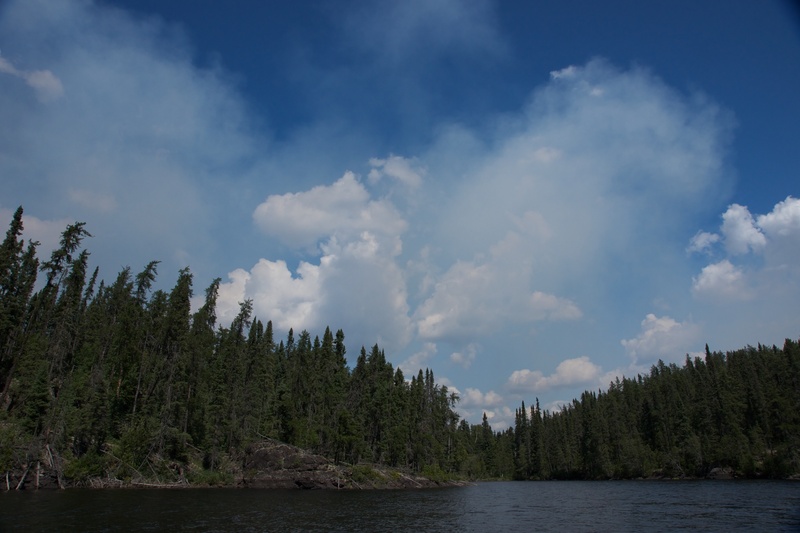 Clearly visible are Thunder Bay 50 and 57 as well as a smaller fire zone just east of the top of Smoothrock Lake whose smoke we smelled the night we camped on an island there. 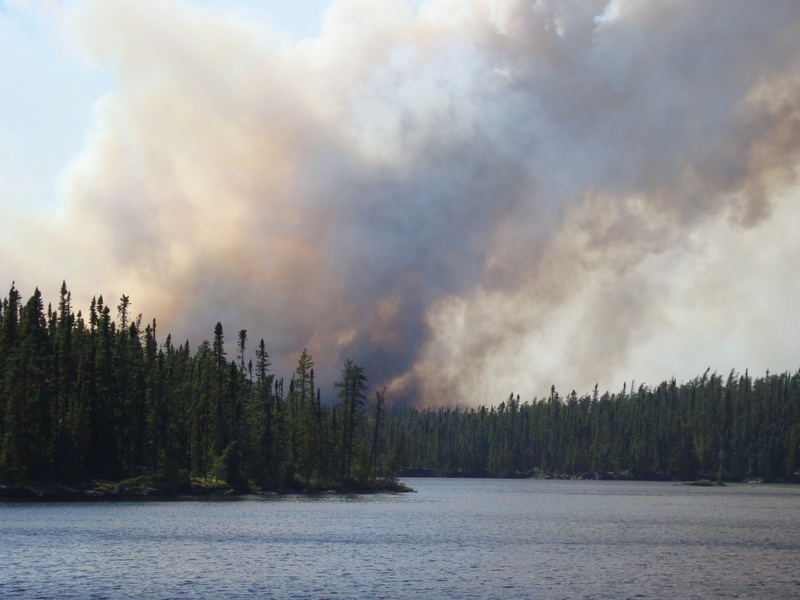 The Ontario Government’s Ministry of Natural Resources has a fire map online which shows the current fire situation in the province. You can access it here. 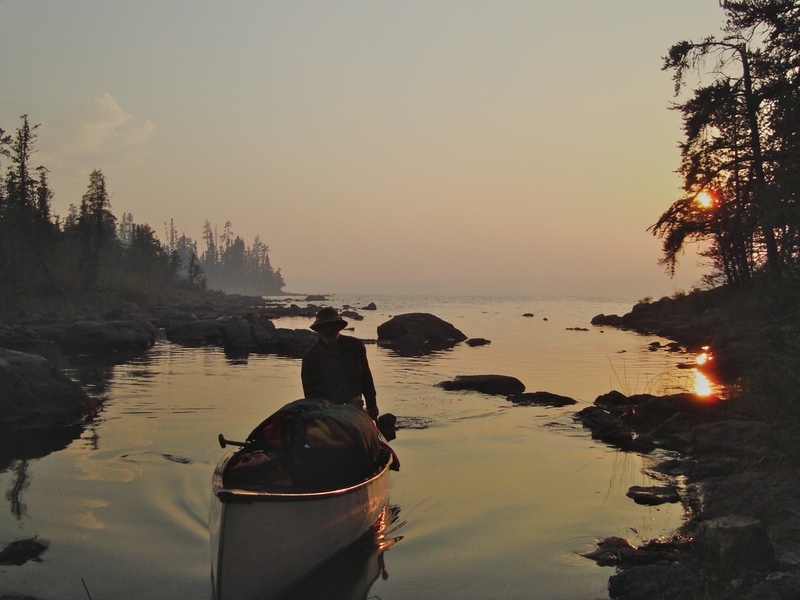 This entry was posted in wilderness canoe tripping and tagged Best island Whitewater Lake, Canadian Shield, Collins Lake, Flindt River Wabakimi, Palisade River, Thunder Bay 50, VIA Rail canoe policy, Wabakimi canoe tripping, Wabakimi Provincial Park, Whitewater Lake. Bookmark the permalink. 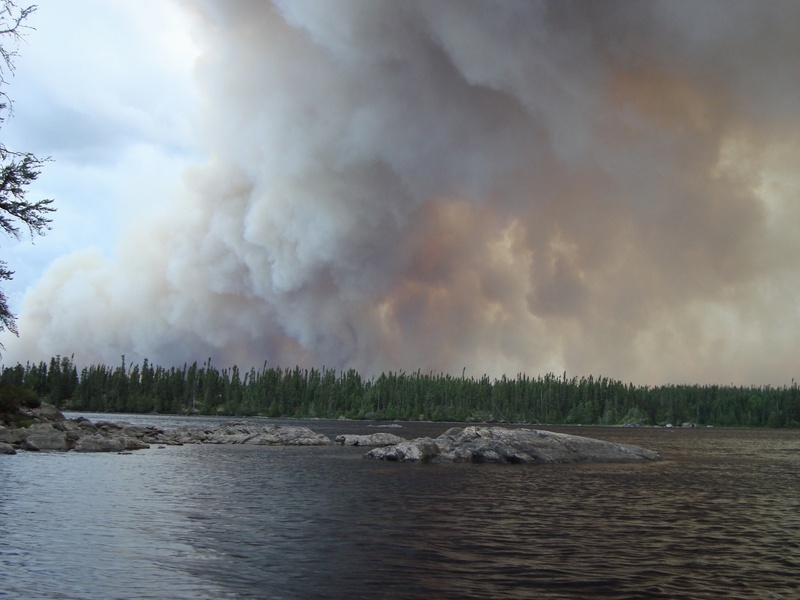 We were also in Wabakimi late August of 2011. We flew in to the Palisade River just E of Burntrock. Needless to say the whole area was charred. 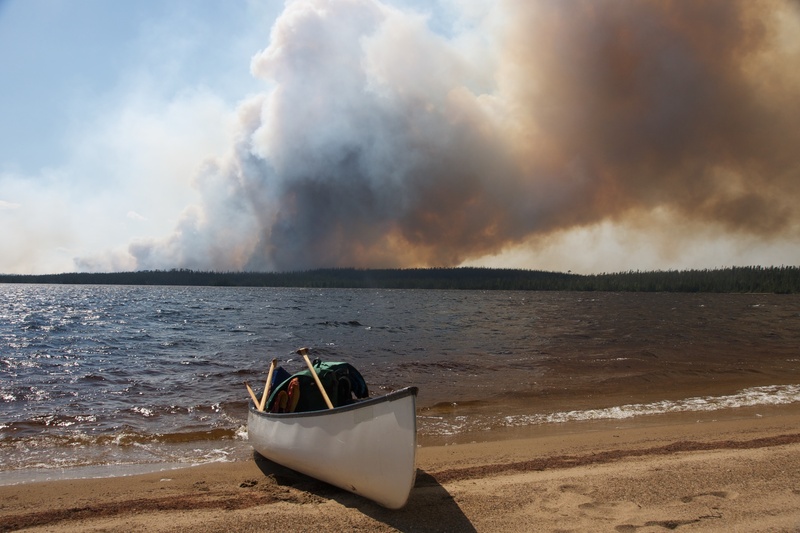 Your story reminds me of ours as we had our own ‘fire’ to get away from east on the Ogoki River (aka Thunder Bay 54) just south of Whitewater Lake. It really blew up one evening while we ate dinner on a campsite where it intersects with the Berg River. By our estimation it appeared to be roughly 5 miles away. It created quite the ‘thunderhead’. Because we were on a small river we felt it would be prudent to continue on to Whitewater (through the night) and get near a big lake. While we saw flames and had ash falling on us, we were a little more concerned about the smoke inhalation. All of this after encountering numerous mini-fires along our route. The second half of our 9 day trip was a bit more uneventful. 🙂 Thanks for sharing your story. And thanks to you, Pam, for sharing yours! Somehow “Bin there, dun that” means something in this case! Quite the thrill, eh. We hadn’t ever experienced something like this before. The summer of 2011 was certainly one for the record books in terms of hectares of bush consumed. We were there from late July to early August – about two weeks. Our original goal was to paddle up into Burntrock Lake and do a paddle around the lake before coming back down the Palisade. 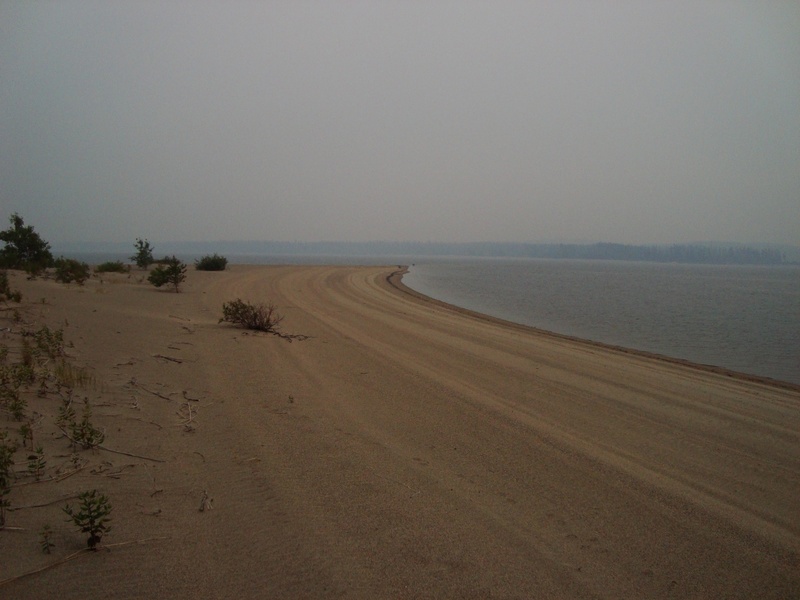 Well, we were there just as the fire centered near Burtrock was at its peak so we headed towards Whitewater Lake. The next summer we flew over the area on the way to the Misehkow River and it was quite the sight. It must have been incredible to be in Burtrock when you were. Any pix? We also deked by Thunder Bay 54 by paddling from Whitewater into McKinley Bay very early one morning. 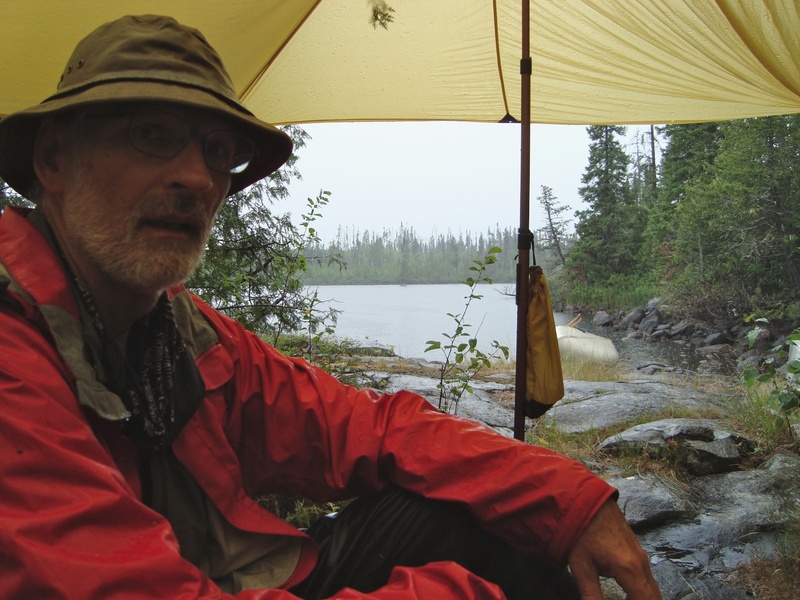 We were elated when it started raining as we were doing the portage into McKInley or Laurent Lake. 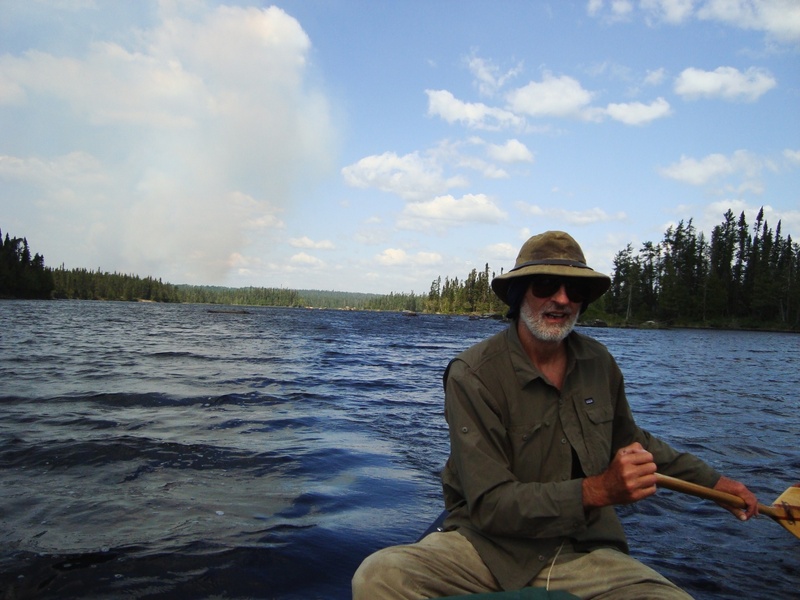 Last summer on the Bloodvein from Murdock Lake to Larus Lake we got to paddle through the results of Red Lake 123, a huge fire which I think was part of the epic 2011 fire season. Here’s this summer’s paddle – we’ll hope for less drama! Gorgeous photos !! That was some trip ! Way to go ! Thanks for the comment! It got me to look at a post I haven’t read in a few years; it was certainly a memrable trip given the epic fire situation that summer!